T- Slightly muted taste at first, followed by a spicy wheat with hints of banana and clove. As it warms I found the clove to come out even more, sortof has the taste of the Schlafly Christmas brew. M- Medium to full body with moderate carbonation. Sortof creamy as it goes down. D- One of my favorite Schlafly brews. I recently took a few friends to Schlafly and they all rave about this beer now. If you like wheat beers, more specifically dunkelweizens, you will love this. Review from BeerAdvocate Magazine June 2007. This beer is a salute to their 15th anniversary, hence the name. Not many brewers go down the road of the American Dark Wheat Ale. It's one of the most underrated beer styles out there, so it's good to see another brewery going for it. Hazed, reddish apple cider color, with a dense and healthy off-white froth that holds its own as it clings to the mug. Sweet floral and wheat aroma with a spicy backing. Hefty medium body with a creamy smooth mouthfeel. Heavy hand of malt up front with layers of spicy wheat, herbal hop and a fruity twang from middle to end. Long-lingering finale of spicy wheat and a touch of herbal hop resin. Quite impressive, to say the least: a clear example that American brewers can be creative without going overboard. Grilled lemon-pepper pork loin and Asiago polenta would be an awesome pairing to toss that this beer. 12 oz. bottle tried 29 Jul 2007. Medium light brown head. Moderate carbonation. Cloudy amber copper color. Aroma is floral, grapey, caramel, touch of banana. Starts spicy sweet, corainder, crisp. More banana and bubblegum through the middle and finish. Somewhat tart finish. Medium chewy body. Could easily finish a few of these. Sample at the brewpub. This beer pours a mostly clear dark orange color with a wispy off-white head that diminishes quickly. Spotty lacing on the glass. Aroma if yeast and orange peels, along with some malt. Light, clean body with a zesty character. Flavors of citrus, spices and yeast are present along with some doughy malt. The finish is spice and yeast with a mild citrus aftertaste. Decent overall. Bottled with love on Nov 13, 2006. Tasted and reviewed on Nov 18, 2006hows that for fresh? No. 15 is a murky light orange in color with a ½ inch thick head that settles into a nicely formed white pasty ring around the pint glasssticky patches noted throughout the course. On the nose are fresh banana custard pie offerings, and soft wheat tones; very aromatic. Some cloves are detectable as this beer warms. Up front, a definitive dark-hefe feel, with some banana peel and wheat-like offerings, creamy and sweet. Kisses of coriander and orange peel; although both are hidden, they are blended nicely. Medium bodied across the boardvery little carbonation. The palate is cleansed, with both bananas, cloves and wheaty-ish malts. This is something that I could get used to. Unique style for this brewery, and incredibly enjoyable for the style; mighty tastya request for a year-round-offering of No. 15? Appearance - iced tea color, a small cream-colored head with average staying power. Some stray lacing, eh. Aroma - yeasty, a bit sweet, some crackery notes. Kind of a standard wheaty nose, but nice. Taste - plenty of yeast flavor in there. A light balancing hoppiness on the swallow. The aftertaste has some grassiness to it, even some mint leaf, also nice. Finishes with some growing bitterness and dryness. Mouthfeel - pleasant smoothness helps offset some frisky carbonation. Moderate weight, well-done. Drinkability - not my favorite style but it's tasty. More of a cooler weather beer for me. I wondered why this tasted so different after just having a pumpkin ale-no wonder. Hazy-somewhat orange color. Had a lot of ppfth when opened but pours rather flat looking. Sharp, slightly spiced aroma. Faint phenolic aroma with a caramel/banana tinge. Clean, malty flavor with a great wheat crispness. Nice sweetness though fairly dry. Decent enough mouthfeel. Quite drinkable and enjoyable. Has all the qualities of being a wheat wine's little brother-good beer all around. Cloudy Amber colored brew with a decent ivory colored head that retains fairly well and manages a bit of decent lace. The aroma is bready, yeasty, spicy with cloves, bananas and hints of brown sugar. The taste starts with wheaties, then bananas, plenty of cloves, coriander and a hint of citrus. The finish is slightly dry and peppery. Medium bodied, smooth and very easy to drink. A definite change of pace and worth a try. Cloudy light copper apricot body with a small finger of light sandy head. Nose is nicely wheat-y. Sugary banana bread mixes with cloves, light plum notes, and a whiff of molasses. Maybe a hint of spicy hops. Multi-grain wheat bread up front. Light banana and some mild tropical fruit sweetness come in. Slight adjunct-y flavor follows along with some fruit juice. Mild spices (cloves, grains of paradise) hang around into the finish. Yeasty bitterness (mild) dries it out. Medium body, with a creamy feel. A nice drinking summer beer from Schlafly. Pour - pours a murky brownish, reddish, orangish, auburnish color with a thin white head. Rather opaque but yet also quite appealing. Aroma - sort of spicy, cinnamon, nutmeg and some sour malt. Has some doppelbock aromas, that of dark fruit and dark bread. Taste - sweet, spicy and quite tasty actually. This beer really impresses me with its subtlety and yet its complexity at the same time. Lots of flavors going on here. You've got some spiciness (nutmeg, thyme, cinnamon, cloves) as well as some dark malt flavors and something akin to Belgian-style dubbel. Quite unique and delicious. Wow. Overall - sort of amazed by how much is going on with a beer that weighs in at 6%. Tons of spice, sweetness and complexity for such a rather simple beer. I really dig it. Would I buy more of it? - I think I would and this would definitely be a beer that I'd make other people try just to get their reaction to it. Hazy orange amber body is topped by a small beige head. Patchy lacing is left on the glass. Aroma is spicy clove and pepper with fruity banana notes. Medium body with a zesty carbonation. Taste is very spicy, suggestive of a pumpkin ale. Notes of ginger, cinnamon, clove, pepper, and allspice float on the palate. Ripe banana fruitiness and wheat cracker make a nice base. Very tasty stuff here. Another winner from Schlafly. Firelight ochre with candied orange peel trim, a tremendously warm and inviting color. The pale tangerine cap is no slouch either. It's thickly creamy, like an apricot milkshake, and is melting in an appealing fashion. It doesn't hurt that it's leaving delicate Belgian lace in the process. This is the best looking ADWA that I've ever seen. I've been enjoying the nose from afar since the pour. It's pretty special up close too. It's chock full of bruised banana and ground clove, especially the latter. I hate to repeat myself, but this is the best ADWA that I've ever smelled and would probably give the world's best dunkel weizens serious runs for their money. Could the flavor possibly measure up? Pretty damn close. I'm well aware that it's personal preference talking, but I'd like to taste and feel a more firm wheat malt backbone. There's nothing wrong with it really, it's just that more would be better. The flavor profile consists of well-toasted wheat malt and the same brown banana and spicy clove that was present in the nose. It looks like Schlafly has chosen a bona fide hefe weizen yeast strain; and an aggressive one at that. More than in most beer of this style (which should be dunkel weizen) the flavor sensations of sweet, bitter and sour are remarkably well-balanced. Each one edges in front at different points along the flavor arc, yet the others are never far behind. It's an interesting effect that would lead to increased drinkability for me (if I had more than this one bottle) since I wouldn't tire of too much sweetness, too much tartness, etc. The mouthfeel would also probably benefit from more malt. Having said that, it's more than acceptable for a 6.0% wheat ale and even becomes lightly viscous as it sits. I definitely like it better now that I'm in the second half of the bottle. I had doubts about No. 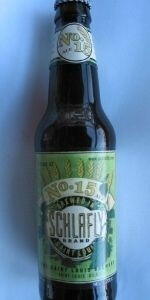 15 being good enough to be Schlafly's 15th Anniversary Ale. After enjoying the hell out it, there's no question in my mind. This stuff is delicious and deserves to be put into foil-wrapped bombers (or wax-dipped if you prefer). Never mind the fact that it's only the fifth, No. 15 is the best American dark wheat that I've ever had. Thanks jpm30. Brown and hazy thin head no lacing. carbonation is moderate and steady. Looks fine. Pretty nice aroma. Fruit and sweet with nice esters. Very full aroma. Nice. Medium body and a clean finish. Some sweetness in the palate, nice fruity character. Pretty good for a dunkel / American dunkel. Don't have much to say, just a good beer. I had this beer on tap at the source Saturday for lunch. It poured a dark hazy brown with a light, fluffy off-white head. The head left a sheet of lace on the side of the glass. The nose definitely tells you this is a weizen beer. Dark fruit with banana esters. I don't get clove, nor did I detect the coriander, and orange the bartender told me where used in the brewing process. The flavor has a load of weizen character. Dark fruit and banana come across strong. I do get some of the orange in the flavor. This beer is quite sweet, not cloying, but the sweetness reduces the drinkability just a touch. Smooth and full mouth feel. Nice beer overall. I enjoyed the Schlafly Oktoberfest, so I was eager to try this, as it was suggested by the manager of the liquor store. Medium tan head. Cloudy, toffee in color. Wheat, spices and fruit in the nose. Very neutral mouthfeel. Not much going on for all the things you smell, and it's over quickly. For such little going on in the mouth, the finish is complex, with the bitter hops balanced nicely by the wheat and spices (cloves or all spice?). Very drinkable. I'm sure I'll purchase a case of this when I visit the liquor store next. On tap at the tap room. I'm a sucker for beers that have the word "Limited" written near their names, especially when I'm traveling. It's like I figure if I'm never going to be somewhere again I might as well go balls out and try the rarest stuff they got. And as I was just starting to make my way through Schlafly's massive beer selection and didn't yet wish to scorch my pallet with the reserve IPA or imperial stout, I decided to give this a try. Big, frothy pour in a big tall weizen glass. Classy. Orange brown with hues blending into one another in the middle yet distinct on either end, like a melting bomb pop. Very nice fluffy head that doesn't go away. Smells like a really firm, well balance weizen. There are little chocolatey hints that kind of remind me of a weizenbock but overall it's much closer to a weizen because its lack of any alcohol burn. The spices are firm: bananas, cloves, white pepper. There's even a very nice hint of cinnamon. Goodness! Highly unique but still perfectly balanced and super drinkable. Full spice of a big, fruity hefe--banana, white pepper, pineapple juice. But the kicker is that the back end is filled up with delicious cinnamon and all spice and strong nodes of pumpkin! It's like you're drinking a pie. What's up with people giving this beer average reviews because of its timidity? Since when does a beer have to rip a hole in your tongue for it to be considered world class? This is like Spotted Cow on crack. A brewer took a huge risk and it paid off in spades. Bravo. A- This beer has a dark copper brown body with a slight haze and a light tan head that fades quickly. There are a few strands of tiny carbonation trailing through the beer. S- The tart cider note give way to a soft bubble gum and clove aroma that becomes more yeasty as the beer warms. As it warms the cider aroma becomes more of a toasted note. T- The soft apple juice tartness with a faint dry biscuit quality give way to a faint clove and yeasty note. The finish is a soft green bitterness that has a club soda flavor and a slight fruity quality. M- This beer has a medium-light mouthfeel with a tight fizz finish. D- The mild wheat flavors and hefe yeast notes are intersting paired with the apple flavors. Pours a dark amber color with a full finger loose foamy head that resists fading, leaving spotty patterns of Belgian lacing behind. The smell is unexpected from a dark wheat...spicy clove and coriander. Adequately carbonated, the mouth feel is light bodied. The spicy pumpkin and interestingly fruity wheat is not typical. A reasonable drinker. Appearance: Pours a clear, amber body with a thin, wispy, white head. Smell: Dark wheat malt aroma with a touch of caramel and notes of sliced bananas, dried apricots, and spices. Taste: Malted wheat, slightly tangy, and with a brief, though satisfying sugary sweetness. Light fruitiness. Tiny pinch of spice. Very restrained bitterness present. Sweetish finish. Drinkability: No doubt a fine drinkable beer, but woefully understated for such an auspicious occasion. Another draft selection I had while visiting the Tap Room. Pint arrived looking hazy with a deep orange color, thin white head of foam that settled to a thin ring. Little retention and no lacing. Smell was definatly wheaty, with some bread and other yeasty and fruity aromas. Tatse was good, very hefe-like. Lots of yeast flavor with a sweet fruity taste. Slight hop grapefruit balanced out by some biscuit malt. Good body, thin but to style, lots of carbonation gave a nice tingle bite on the mouthfeel. Another good one. Also have tried it bottled. Note to self: Ranked #1 American Dark Wheat Ale when I tried it. Many thanks to Corey for sharing a bottle of this from his private reserve! A - Pours a semi-opaque dark cestnut color with a one fingered, creamy off white colored head and moderate carbonation. Looks absolutely beautiful in my 12 ounce Schneiderweisse glass! S - Not because of my glass selection, but the color and aroma reminds me a little bit of Schneiderweisse Original beer. Generous amounts of banana, cloves, and German malt. T - Not as robust as a German dark wheat beer, but still, pretty darn tastey. The flavor stays even throughout with nice amounts of banana, cloves, some caramel German style malt, and a little bready and chewy. Overall taste is very mildly acrid, and there's a delicate hopping at the very end to bring the up front sweetness back into check. M - Little to no carbonation as it rolls over the tongue, lighter side of medium bodied, finishes semi-dry, and leaves an aftertaste that's peppery with some banana bread spicing. D - Is good but since it reminds me so much of a German beer I'd rather have a Schneiderweisse or another German wheat for the fact they have much more body and in most cases, a much more accentuated aroma and flavor. However, this is a pretty good interpretation of a dark German wheat. From the TapRoom served with a steak sandwitch and fries just before the Sunday night BJCP class. A noticable haze within the Dunkle style color and a wonderful head with size and retention you want in this style. A welcoming aroma from the wheat and yeast with little on no spices - the clove seems naturally produced and dominates the bananna. Medium body - perhaps a little more than the guides but much to my liking. Some moderate sweetness that only seems out of place if you drink it so slow as let it lose most of its moderate carbonation. With warming offers some dark fruit flavors. Congratulations to Tom, Steve, and all the Schlafly crew. Poured an amber oak, topped by a thick layer of tan heading. Bottom of the bottle had a nice ring of yeast, which were swirled and added, turning the pour hazy brown. Sharp spices,fruits, and bubblegum in the aroma, and then the quaff: man, what a meaty-wheat backbone of malt. I luv this stuff, and for a two-fer, the wife and daughter thought it top notch also. A real session drinker for all. Dont you dare put any fruit in this stand-alone excellent brew. Wow, this should come around yearly, it will be dearly missed after its gone. BUMMER! Thanks to Vancer for sending this to me as part of my BA Anniv. pacakge. A: Pours a dark murky bourbon color. Reddish, oranges, and peach all blended together. Cream colored head, with streaks, dissipates rather quickly. S: Nice belgian phenols with that spicy wheatyness. Slight bubblegum aroma backed by grassy notes. T/M: Wheat notes take over the palate followed by a grainy dryer finish. Spices--mostly cloves, banana, and bubblegum are detected. Smooth and creamy with a soft touch on the tongue. Pretty nice with a sweet finish laced with cloves. D: Possibly a nice fall evening brew as the slight heaviness of the wheat makes the body work a bit harder. Nice and refreshing--glad I had the chance.